We've been covering several of NEA's weekly features lately, of which Radiotics is another. Unlike those others we've been discussing lately, however, this one was not offered only with the NEA's weekly Pony Service, but was included in their regular offerings for dailies. 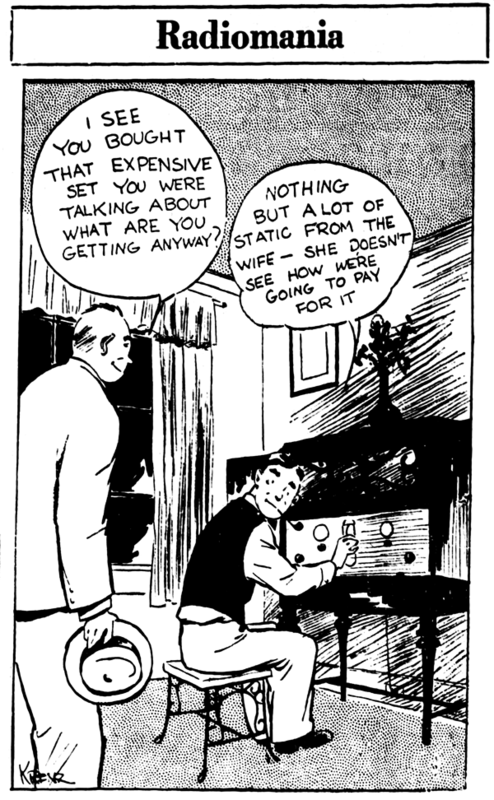 Radiotics was meant to be a part of newspaper radio pages, which were mostly once-a-week affairs, hence the frequency of this panel. 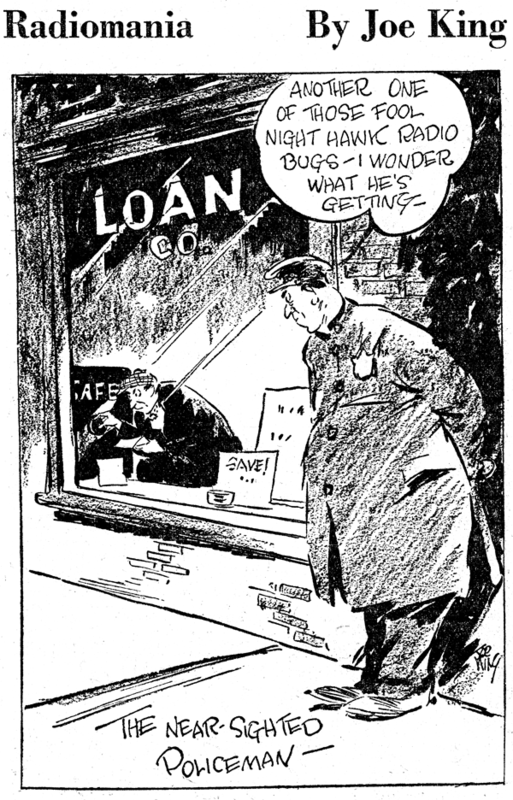 Unfortunately, this weekly panel was recorded only spottily in the NEA archives at Ohio State University, so in order to track its many artist changes, I've had to rely on newspaper sources, which are anything but reliable with these weekly panels, so take the dates with a grain of salt. Radiotics debuted in October 1927, seemingly a rather late entry in the radio panel sweepstakes. However, it is probable that it was intended by NEA as a continuation of their weekly radio strip feature Bugs which began in 1924 and had ended the previous month. Since that was a strip and this is a panel, though, I'm calling them separate features. The first artist on Radiotics was the wonderfully named NEA bullpenner Joe King (get it? get it? ), who had a pleasing drybrush style. You'll notice that the sample of Joe King's work above is titled Radiomania, not Radiotics. That's because NEA changed the title of the feature in 1928, presumably because Associated Editors was distributing a radio panel feature by Fred Neher with the name Radiotic. Amazing that two creators would come up with the same awful dissonant sounding name, but at least NEA had the sense to change to the much more pleasing Radiomania. 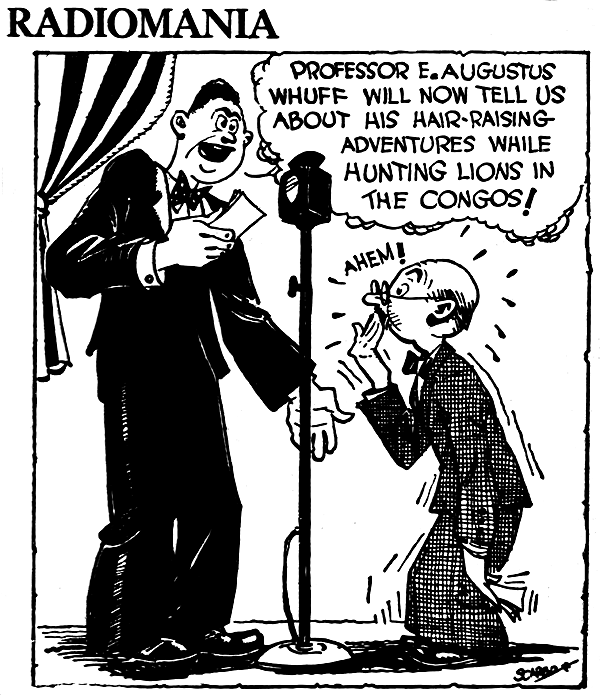 Joe King penned the feature until April 1929, when he handed the baton to Art Krenz. Krenz was NEA's resident sports cartoonist, but evidently hadn't built up enough tenure yet to avoid this assignment. He was better at talking his way out of doing it, though, because he only produced it for about a month. In May 1929 Dorothy Urfer took over, possibly her first assignment for NEA (she began Annibelle later that year). It took her quite awhile to palm Radiomania off on someone else -- her stint lasted until September 1930. Replacing Urfer was a fellow by the name of Charles Okerbloom Jr. He had a very nice mature cartooning style, but I know of no other work he did for NEA or any other syndicate. He later became known as a fine artist and spent many years as an art teacher. A real loss to newspaper cartooning, imho. Okerbloom's first stint on Radiomania only lasted about a month, and then NEA go-to guy George Scarbo took over. The always overworked Scarbo lasted through much of November-December 1930, until he was able to pass the ball back to Okerbloom. 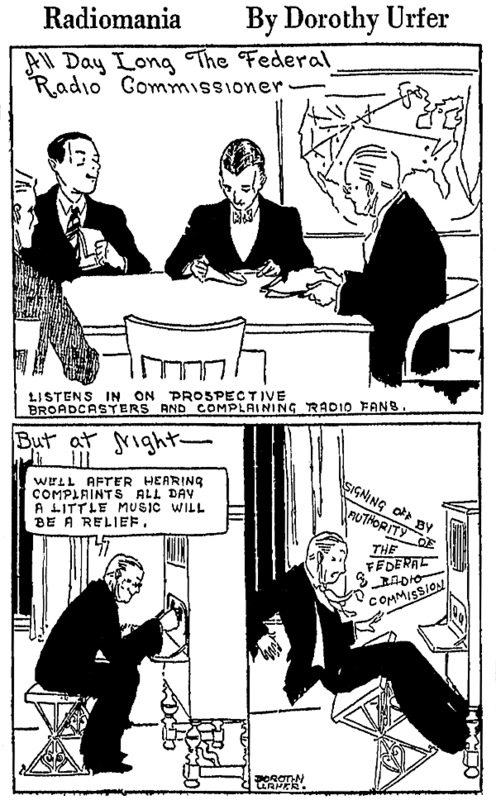 Okerbloom then handled the panel from January until October 1931, when Scarbo had the panel dumped back in his lap. 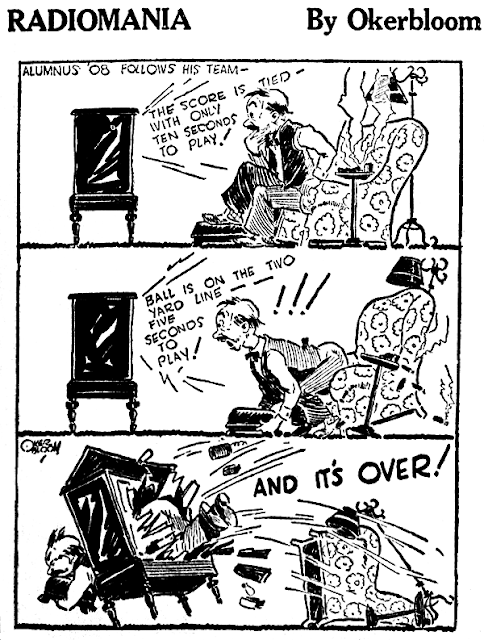 Scarbo kept at it until February 1932, when the feature was finally taken off the air. One important postscript about Radiomania is that the dates I'm citing are rather oversimplified. Although I can find no paper that ran the panel with anything approaching a perfect consistent record, I see so many instances of old panels being reused after the initial stint by Joe King that I'm pretty confident in saying that none of the subsequent cartoonists produced the panel every single week. I believe that NEA was not above re-running old panels of this feature on a pretty frequent basis. Therefore you'll see Okerblooms, Scarbos, Urfers and King panels appearing well away from the dates I'm citing above.